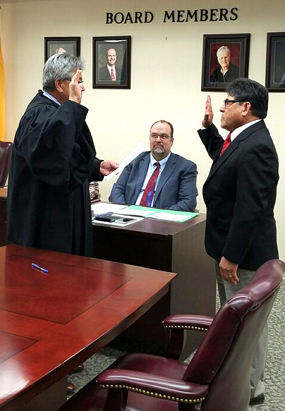 The newest member of the Artesia Public Schools Board of Education, Luis Florez, is shown being sworn in Monday at the APS Administration Building by Magistrate Judge Daniel Reyes as assistant superintendent Danny Parker looks on. Florez ran unopposed in February to fill the District 2 seat vacated by longtime member Margaret Aguilar. David Conklin and Lowell Irby won reelection in Districts 1 and 4 respectively. The board also elected officers Monday, with Irby being renamed president, Jeff Bowman vice president, and Carolyn Shearman secretary.